Another top Twins prospect is set to make his big league debut. Stephen Gonsalves will take the place of the injured Ervin Santana. Since being promoted to Triple A this season, Gonsalves has posted a 2.96 ERA with 95 strikeouts in 100.1 innings. The 24-year old lefty has been one of the team’s top pitching prospects throughout his time in the organization. Before Gonsalves makes his debut, there was plenty of other Sunday action down on the farm. OF Robbie Grossman returned to the Twins after ending his rehab assignment with Rochester. RHP Alan Busenitz was recalled from Rochester to Minnesota. Kennys Vargas got the scoring started for the Red Wings with a solo home run in the fourth inning. It was his 19th long ball of the season. Vargas also drove in the tying run in the top of the ninth. Byron Buxton and Gregorio Petit had both walked before Vargas popped a single to left. In extra-innings, Juan Graterol drove in LaMonte Wade, the runner that started on second. Rochester was up 3-2 but it wouldn’t last. On the mound, Ryan Eades pitched four scoreless inning, striking out five and walking one. Luke Bard surrendered two runs on three hits and two walks in 1 2/3 innings. Ryne Harper calmed some of the storm with 2 1/3 scoreless innings while adding a pair of strikeouts. John Curtiss took the loss, his fourth. He allowed one earned run (two total runs) on four hits in the final frame. Chattanooga was staked to an early lead after a two-run double off the bat of Brian Navarreto. Jaylin Davis and Chris Paul had both drawn two-out walks to get on ahead of the Navarreto extra-base knock. Unfortunately, that’s where the scoring ended for the Lookouts. Jorge Alcala pitched into the fourth inning (3 2/3 innings) by allowing three earned runs on five hits. He struck out six and walked four. Cody Stashak took over for Alcala and limited the Biscuits to one hit in 2 1/3 innings. Anthony Marzi allowed one earned run (two total runs) on five hits with two strikeouts in two innings. The Lookouts left eight men on base and went 2-for-5 with runners in scoring position. Navarreto was the only batter with an extra-base knock. Zander Wiel reached base three times out of the lead-off spot. Fort Myers had won nine straight series but that came to an end on Sunday. Griffin Jax started and went six innings for the 11th time in his last 13 starts. Both runs scored came on the same play. Jax gave up an RBI triple but then the relay throw soared into the Miracle dugout. Jax struck out four and didn’t walk any. The Miracle bullpen combined for three scoreless frames. Hector Lujan was asked to get one out. Ryan Mason allowed two hits and struck out one in 1 2/3 innings. Kevin Marnon finished off the game with a scoreless ninth as he struck out one. Alex Kirilloff went 3-for-4 and is hitting .375 in the Florida State League. He extended his on-base streak to 31 games. Aaron Whitefield added his fifth double as part of a two-hit day. Caleb Hamilton had one hit but it was his 17th double. Overall, the team went 0-for-4 with runners in scoring position. Charlotte lost on Sunday so Fort Myers remains 0.5 games back in the second half South Division standings. 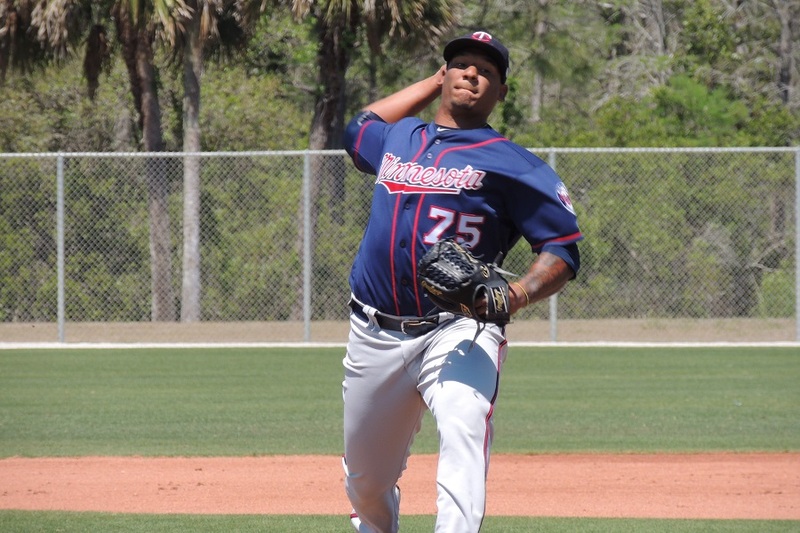 Edwar Colina set a career high with 10 strikeouts as he helped the Kernels to improve to 66-59 on the season. It was the sixth consecutive quality start for Colina as he only allowed one run in 6 1/3 innings. He also took over the team lead for strikeouts (95) by passing Bailey Ober (88). Michael Helman gave Colina some early support as he cracked a solo shot in the first inning. It was his first Midwest League home run. The Kernels added to their lead in the seventh after David Banuelos hit a double and moved to third on an error. Akil Baddoo drove him in with a single. In the ninth inning, Michael Davis gave Cedar Rapids an insurance run with a solo home run. Trevor Larnach went 2-for-3 and reached base a third time with a walk. Moises Gomez earned a save the hard way by tossing 2 2/3 innings. He allowed one run on two hits and struck out a pair. In the completion of a game suspended on August 1st, the E-Twins were able to pull away from Johnson City. Elizabethton had scored a first-inning run after Lean Marrero and Trevor Larnach notched back-to-back doubles. Marrero helped add to the lead with an RBI single in the fourth frame. Colton Burns would also single to push the club up 3-1. Johnson City tied things in the bottom of the fourth but the E-Twins found a way to get back on top. Ricky De La Torre collected a one-out single and moved to second after Jared Akins was hit by a pitch. Robert Molina singled to drive in the go-ahead run. Luis Rijo had originally started the game and went two innings by allowing one earned run. He struck out two and walked one. Carlos Suniaga pitched all five innings on Sunday. Two unearned runs were scored against him but he still earned his second victory. He struck out six and didn’t walk any. Johnson City jumped out to an early 2-0 lead and didn’t look back. Josh Winder started and allowed two earned runs on six hits. He struck out five and walked one. J.T. Perez pitched a pair of scoreless innings before running into trouble in the seventh. He allowed four runs on two hits and three walks in 2 1/3 innings. Juan Gamez got the final two outs but he did allow so inherited runners to score. The E-Twins only had four opportunities to bat with runners in scoring position. Ricky De La Torre had his eighth double, the team’s only extra-base hit. 5. Stephen Gonsalves (MIN): Did not play. 20. Luis Arraez (CHAT): Did not play. I hope that they are courageous and bring up Kiriloff for Sept.I was just in St Louis and watched the Nationals Soto in left field.Kiriloff might be one of those who just come with all the talent ready made. Its a shame Kirilloff won't have enough at bats to qualify for the batting crown in the FSL.He is about 75 points ahead of the current leader. We've seen Vargas' name in these write-ups a lot this month.Checked and he is over .300 average with 6 home runs in August.Good for him.Hopefully it will get him a contract with someone over the winter. Another great start by Jax, who just might move up the ladder real fast the next two years.And this Colina guy has been good all year, but really good since the break.Expect he is another guy that is going to get a lot of consideration when you do your rankings this fall.And Helman must have read the comment section yesterday and said, "hey, I can hit home runs too." I believe the last Twin to be promoted direct from hi A ball to the majors is the great Kent Hrbeck. Puckett went from Double A to majors. Be pretty special to have Kirilloff join Hrbeck. I think Jorge Polanco's first cup of coffee was directly from Ft Myers.This was because he was already on the 40-man as an international signee and the Twins needed a fill in for an injury.He hit pretty well in a limited number of at bats. I do remember reading this article., but it was worth a reread. Colina definitely has me intrigued. Can anyone tell me how hard Colina throws? I know it's too early to write in Kirilloff as a starter in the Twins outfield.But if he is, who is the proverbial odd man out between Buxton, Rosario and Kepler.Should the Twins plan for that likely Kirilloff future by trading Buxton or Kepler in the off-season?If something happens to Kirilloff, there are other options (Wade, Cave . . .) to fit in. “He’s got plus stuff,” Gardenhire said of Colina. “He’s got a really good fastball, obviously, he runs it up there 95, 96 (miles per hour) a lot of times. He’s got a really good slider and a good change-up that he’s been working on. And the ball moves, that’s the biggest thing. He’s 95, 96 and it doesn’t go straight. He’s got a lot of sink. Move Rosario to third (I'm honestly willing to let them try that. I think he could pull it off). Or Kepler to first. Or trade Kepler. About a year early to be talking about trades or Kirilloff being up.Kirilloff might see some ST game and then start the year at AA.What happens then we'll see, but he'll be given half a year in the Minors to show he can produce numbers and for the Twins to make a move. That's really encouraging, though Gardenhire probably liked the "lot of sink" more than the new front office does. I'm encouraged that a pitcher's height no longer appears to be a de facto disqualification for starting opportunities. I hope that they are courageous and bring up Kiriloff for Sept. I was just in St Louis and watched the Nationals Soto in left field. Kiriloff might be one of those who just come with all the talent ready made. It's not courageous. It's wreckless to start his service clock and option years in a lost season. I could get behind any kind of creative possibilities. Normally I'd say the Twins should wait until everyone has gotten a taste of the MLB before deciding down a path, but there are just so many corner bats lurking that they probably should make some pre-emptive decisions this offseason, even if they haven't seen everyone. Reminds me of early this century when the Twins had Hunter and Jones as locks and were dabbling with Mohr, Kielty and Buchanan while Cuddyer, Restovich, Kubel, Morneau, Ryan, Ford, Sears and others were all knocking on the door. Kielty and Buchanan were moved in quality trades and several of the others were long time fixtures. Kepler and Kiriloff can both play first. Who knows, maybe this Tyler Austin would be a nice guy to plug in against LH starters too. But yeah, 2020 is probably a realistic and prudent timetable unless he hits .379 in Chattanooga with power numbers. I hope we'll see both Lewis and Kiriloff in Arizona this Fall; but I think we can only take one single A player, is that correct? Agree with the concept.Those trades were examples of good Terry Ryan.Not only because he was 'proactive' in looking for the opportunities, and got good (really great) value for Kielty and Buchanan....but because they made the correct choices in which pieces of the depth to trade vs keep.Bad Terry, proactively traded Hicks because he was sure about Buxton.Might want to be 'more sure' (at least AA sure?) about Kiriloff before we part ways with any of the major league pieces. That rule no longer exists, so both could go. Keeping in mind that was Toby, not Ron. Toby was hired by the current FO, if I remember correctly. Like many, maybe all sons out there, I'd like to think that Toby acquired all of his Dad's qualities that made him a good manager, while developing his own personality independent of his father--one that probably goes counter to his pop's "old-fashioned thinking." Adjusting for generations, Toby probably got Ron started on digital music via iPod, and Ron probably reluctantly gave up his CD collection, after first burning all of his Johnny Cash albums. And...I'm losing the thread of this metaphor. But everybody agrees Johnny Cash is good. And neither one of them probably understood Kevin Slowey's infatuation with vinyl. Are the Nationals reckless with Soto and the Braves with Acuna? They were both contenders when they called them up. The Twins are not. You have to be strategic when it comes to players you think have star potential. I’m worried that a jump fromA ball to the show would affect his confidence. I would recommend a half 2019 as a Lookout. Maybe fall of ‘19? I guess I am a pessimist on this site, but I don’t see the Twins contending in’19. But he 20’s should be roaring. I see him as a 1B. I can’t see a sell low trade for Bux. As for Kepler, well, I can admit that I’ve always been wrong on Home. Can anyone, please, explain why we we were all writing a year ago about his inability to hit lefties, while this year he can’t hit righties? The “dabble around the plate” reminds me of Gibson up until last year. I hope it won’t take him many trips back to the minors, as it did Gibson, before he gets the message to trust his stuff and throw strikes.